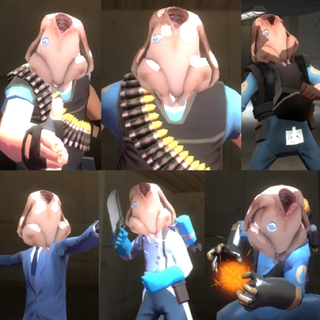 Who Doesn't Want To Play Team Fortress 2 with a Turkey Head? In an old Mr. Bean episode titled "Merry Christmas, Mr. Bean", the titular hero gets his head lodged in a turkey. It's a classic, and what inspired this Team Fortress 2 workshop creation. Items in Steam Workshop are up for consideration in Team Fortress 2. While the game is known for its funny hats, it also should be known for its fresh poultry. On players' heads. If for some reason you have not seen the previously mentioned Mr. Bean episode, do yourself a favor and watch it here. If you've already seen it, do yourself a favor and watch it again. And again.